Family Foot Clinic and Orthotic Centre Celebrates 25 Years In Business! On October 13, 2017 the Family Foot Clinic and Orthotic Centre’s Founder and Director, Roberto F. Clausi, B.Sc. (Podiatric Medicine, D.Ch. 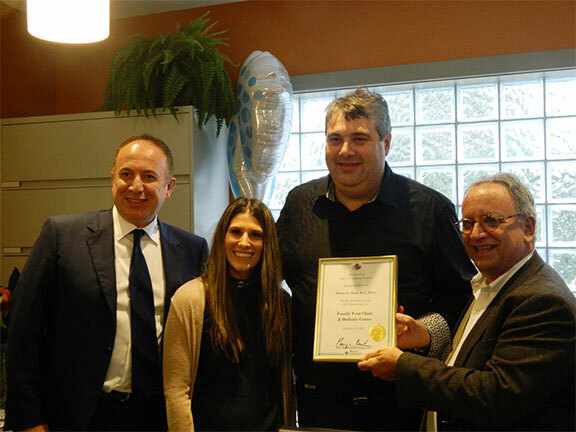 Registered Chiropodist - Foot Specialist) and his expert staff celebrated a milestone 25 years in business! In attendance were supporters, families, friends, clients, community members and local dignitaries—including Mayor Maurizio Bevilacqua & Ward 2 Councillor Tony Carella. The celebration featured great refreshments and delicious treats, along with a certificate presentation from the City—which honored Roberto and his Centre for the remarkable accomplishment. Since opening his practice in Vaughan in 1992, Roberto has worked tirelessly to bring high-quality services to his clients. Due to his extensive knowledge and expertise, he provides comprehensive foot care—to all ages, from children to seniors—using the latest and advanced treatment technologies and Podiatric Medicine. Some of the services offered include, foot and ankle treatments using physical therapies for injuries, including shockwave therapy and laser therapy, custom orthopedic appliances, dermatological, skin and nail problems, wound care, surgical procedures and injection therapy. Diabetic foot care and the performing of Biomechanical assessments and gait (walking) analysis reports are also offered. To learn more, please contact the Centre at 905-850-7837 or visit: www.sorefeet.ca.